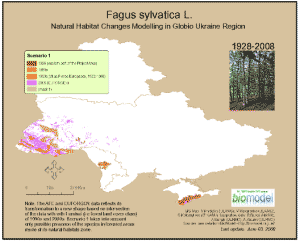 Post Tagged with: "fagus sylvatica"
The map shows appearance of climatic suitable territories of the species by 2050 (which is actually steppe and potentially can’t be acceptable for Fagus sylvatica survival by other options). http://biomodel.info/?page_id=240. Note. Climatic modelling does not include any other factors. A final map’s reliability will require corrections i.e. usage of other survival options and expert evaluations.